Chronic hepatitis C virus (HCV) infection is a major cause of liver disease worldwide. HCV infection is currently treated with IFNα plus ribavirin for 24 to 48 weeks. This demanding therapy fails in up to 50% of patients, so the use of pharmacogenetic biomarkers to predict the outcome of treatment would reduce futile treatment of non-responders and help identify patients in whom therapy would be justified. Both IFNα and ribavirin primarily act by modulating the immune system of the patient, and HCV uses multiple mechanisms to counteract the antiviral effects stimulated by therapy. Therefore, response to therapy is influenced by variations in human genes governing the immune system and by differences in HCV genes that blunt antiviral immune responses. This article summarizes recent advances in understanding how host and viral genetic variation affect outcome of therapy. The most notable human associations are polymorphisms within the IL28B gene, but variations in human leukocyte antigen and cytokine genes have also been associated with treatment outcome. The most prominent viral genetic association with outcome of therapy is that HCV genotype 1 is much less sensitive to treatment than genotypes 2 and 3, but genetic differences below the genotype level also influence outcome of therapy, presumably by modulating the ability of viral genes to blunt antiviral immune responses. Pharmacogenetic prediction of the outcome of IFN-based therapy for HCV will require integrating the efficacies of the immunosuppressive mechanisms of a viral isolate, and then interpreting the viral resistance potential in context of the genetic profile of the patient at loci associated with outcome of therapy. Direct-acting inhibitors of HCV that will be used in combination with IFNα are nearing approval, so genetic prediction for anti-HCV therapy will soon need to incorporate viral genetic markers of viral resistance to the new drugs. Up to 170 million people worldwide are chronically infected with hepatitis C virus (HCV) . Chronic HCV infection is asymptomatic or associated with relatively mild hepatitis in most individuals. However, about 20% of patients have progressive hepatitis, where disease proceeds from hepatitis of gradually worsening severity, through increasing hepatic fibrosis and cirrhosis, and eventually terminating in fatal liver failure or hepatocellular carcinoma . The rate of progression along this path varies from a few years in exceptionally rapid progressors to many decades in slow progressors, with relatively slow progression being the norm. HCV is a hepatotropic flavivirus in the Hepacivirus genus. The enveloped virion contains a positive-polarity RNA genome that is about 9,600 nucleotides long and encodes a polyprotein of roughly 3,000 amino acids. Cleavage of the polyprotein produces three structural proteins (core, E1 and E2) and seven non-structural proteins (P7, NS2, NS3, NS4A, NS4B, NS5A and NS5B). The HCV genome is genetically very variable, with six genotypes that are less than 72% genetically identical, and over 100 subtypes with identities of 75% to 86% . Genotype 1 accounts for about 75% of the HCV isolates in the USA; almost all are subtype 1a or 1b. Independent HCV isolates of a given subtype typically differ by 6% to 10%, and genetic variation between viral genomes within an individual is usually 1% to 3% because of the replication of HCV as a quasispecies (that is, a collection of genetic variants that clusters around a master sequence and that evolves as a unit ). HCV infection is currently treated with a combination of pegylated IFNα and ribavirin. Treatment eliminates the virus (sustained viral response, SVR) in 50% to 60% of genotype 1 patients . Treatment typically lasts for 48 weeks, but it is discontinued if viremia is present at 24 weeks because the chances of achieving SVR are negligible if the virus is detectable at this time. There are two major drawbacks to this therapy beyond its limited efficacy. First, IFNα causes severe side-effects, including flu-like illness, depression, anorexia, anemia and lymphopenia, and these problems are exacerbated by ribavirin [6, 7]. The risk of these complications is high enough that many patients are ineligible for treatment. Treatment therefore requires supervision by a skilled medical team, and even then a third of patients can be incapable of taking the full regimen without dose reductions. Second, therapy can cost over US$40,000 per patient , and hence it is unaffordable for many patients. Numerous direct-acting inhibitors of the enzymes of HCV are under development [9–11], and two NS3 protease inhibitors are likely to be approved in 2011. However, all direct-acting inhibitors of HCV are plagued by very rapid development of resistance due to the high genetic diversity and rapid evolution of HCV, and hence the new drugs will be used in combination with IFNα and ribavirin for the foreseeable future . 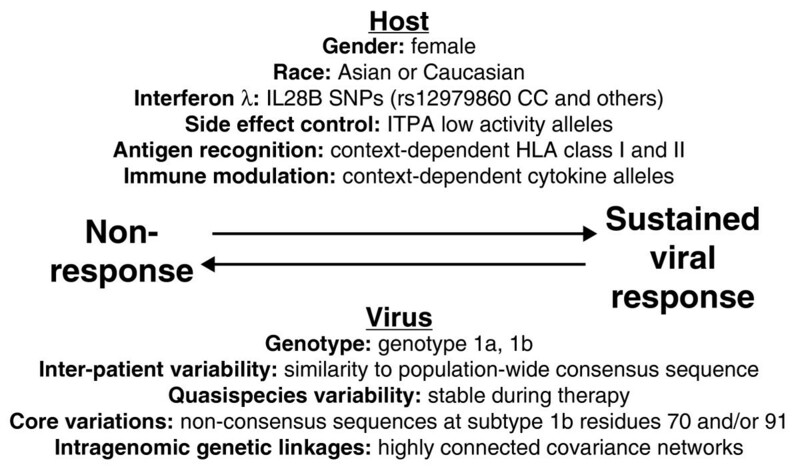 Here, we review recent advances in our knowledge concerning the host and viral genetic variables that affect outcome of therapy. IFNα provides the primary antiviral effect and can clear HCV when used alone, whereas ribavirin is ineffective by itself but roughly doubles the viral clearance rate when taken with IFN [5, 13]. The mechanisms by which IFNα and ribavirin suppress HCV are incompletely understood, but each drug clearly acts through multiple mechanisms. IFNα triggers the type 1 IFN response and stimulates adaptive immune responses to the virus, but the details of how these cellular responses control HCV are largely unknown. Ribavirin may act by skewing host immunity towards a Th1-type response, amplifying the type 1 IFN response, suppressing cellular guanosine triphosphate pools, and/or interfering with the fidelity of HCV replication. Importantly, all of these antiviral pressures are mediated by cellular effectors, with the exception of the potential impact of ribavirin on the viral RNA polymerase. The outcome of IFN-based therapy for HCV is dependent on the genetic systems of both the human host and the virus. Host genetic factors that influence the outcome of therapy include gender, race and variation in genes of the immune system. The primary viral genetic factor is the HCV genotype because some genotypes are more sensitive to IFN than others, but other aspects of viral variability are also important. The major host and viral genetic factors affecting outcome of therapy are summarized in Figure 1. Prominent host and viral genetic factors that influence the outcome of IFN-based therapy for HCV. The best-documented host genetic factors that favor viral clearance and HCV factors that promote viral survival during therapy are indicated. HLA, human leukocyte antigen; ITPA, inosine triphosphatase; SNP, single-nucleotide polymorphism. The human immune responses to HCV and the countermeasures of the virus are directly relevant to antiviral therapy because the dominant drug in therapy is IFNα, which is a key cytokine in the type 1 IFN response. The replication of HCV replication triggers innate immune pressures, and then the virus counters these immune responses with an array of immunosuppressive strategies to promote its persistence [14, 15]. The best understood immunosuppressive strategies include inhibition of protein kinase R (PKR) by the viral NS5A and E2 proteins, cleavage of cellular signal transduction molecules downstream of the pathogen RNA sensors RIG-I and TLR3 by the NS3/4A protein, and altering IL12 production through secretion of the core protein; other less thoroughly characterized suppressive activities also exist. Accurate prediction of the outcome of therapy would reduce complications associated with futile treatment while simultaneously increasing the number of potential responders who receive therapy. The pleiotropic pressures applied against HCV by IFN-based therapy have two key implications on pharmacogenetic personalization of treatment for HCV. First, the role of the immune system in pharmacological control of HCV indicates that human genetic polymorphisms affecting these pathways could modulate efficacy of therapy. Second, viral resistance to IFN-based therapies will be proportional to the net effect of the multiple immunosuppressive activities of HCV. Therefore, predicting the outcome of therapy will require integrating the efficacies of the immunosuppressive mechanisms of a given HCV isolate, and then interpreting the viral resistance potential in context of the genetic profile of the patient at loci associated with outcome of treatment. The dominant role of the immunomodulator IFNα in treating HCV infection has driven an extensive search for genetic associations between components of the immune system and outcome of therapy [16–18] (Table 1). Many studies have focused on the human leukocyte antigen class I and II genes, and most, but not all, studies have found associations between particular alleles and outcome of IFN-based therapy. However, there is little overlap in the alleles identified by the various groups. Genetic associations with outcome of therapy have also been reported for the genes encoding KIR2DL5, IL6, IL10, IL12B, CCL5, TGFβ, TNFα, IFNγ, osteopontin, GNB3, and CTLA4. However, other studies have failed to find associations with many of these genes. The inconsistencies in these data appear to be due to differences among the studies in the racial make-up and HIV co-infection status of the cohorts, the definition of therapeutic response, the therapy employed (IFNα monotherapy, IFN plus ribavirin, or pegylated IFN plus ribavirin), and the HCV genotype infecting the study participants. Together, these data clearly demonstrate that polymorphisms in immune system genes can strongly influence the outcome of anti-HCV therapy, but these associations appear to be context dependent, and hence are unlikely to be broadly useful in predicting treatment outcome. HLA, human leukocyte antigen; IFN, interferon; NA, not applicable; SNP, single-nucleotide polymorphism; SVR, sustained viral response; UTR, untranslated region. A breakthrough in understanding human genetic associations with outcome of therapy occurred in 2009 when three seminal genome-wide association studies demonstrated that polymorphisms near the IL28B gene, which encodes IFNλ3 , were strongly associated with treatment outcome for HCV genotype 1 [20–22]. The strongest association was found for SNP rs12979860, located about 3 kb upstream of the IL28B coding region. Patients with a CC genotype at this SNP were more than twice as likely to achieve SVR as patients with a CT or TT genotype . The three studies each identified different SNPs near IL28B, but the underlying biological association with treatment outcome appears to be the same because there is a strong linkage disequilibrium among these SNPs. Suppiah et al. estimated that the cumulative effect of the favorable allele at the IL28B locus is to increase SVR by 32% relative to a population in which the allele is absent (population attributable risk). The favorable association of the CC genotype was found in patients of both European and African-American descent, and differential prevalence of the CC genotype explained approximately half of the twofold poorer response rate to treatment found in African Americans [20, 23]. The effect of variation at r12979860 with HCV treatment outcome has been validated in a new cohort that included 186 genotype 1 and 45 genotype 2 or 3 patients . The r12979860 SNP has also been associated with more rapid decline of viral titers during therapy and with end-of-treatment response . An association of the CC genotype at the r12979860 SNP with SVR is also found in patients infected with the easier-to-treat HCV genotypes 2 or 3, but only in patients who do not have a rapid early decline in HCV titers . The association of IL28B polymorphisms and response to treatment also appears to hold in patients that are co-infected with HIV [27–29]. A similar association of polymorphisms in the IL28B r12979860 SNP is found with spontaneous clearance of acute genotype 1 HCV infection [30–32], and with a different SNP for patients infected with genotype 1 or 4 for both spontaneous clearance and response to therapy . The IL28B gene encodes the type 3 IFN, IFNλ . IFNλ has been shown to inhibit HCV replication , so the variations in the IL28B gene mutations presumably affect the efficacy of the innate immune response against HCV during therapy. Regardless of mechanism, the very strong association of the IL28B polymorphisms with outcome of IFN-based therapy has already led to clinical genetic tests to help guide antiviral treatment. The association of human SNPs with ribavirin-induced reduction in hemoglobin levels has also been assessed  because treatment-induced hemolytic anemia is one of the most serious side-effects of IFN-based therapy . This does not directly address treatment outcome, but anemia often causes dose reductions that lower treatment efficacy. Genotypes of SNPs rs1127354 and rs7270101 within the inosine triphosphatase gene that decrease the activity of the enzyme have been found to be strongly associated with protection against anemia . These results were confirmed in an independent cohort of western patients . Two additional studies confirmed the association of rs1127354, but not rs7270101, with ribavirin-induced anemia in Japanese patients infected with HCV genotype 1b [37, 38]. Sakamoto et al. also found that patients with the favorable inosine triphosphatase allele have a higher rate of SVR, which they attribute to better adherence to therapy. The clearest indication that the high genetic variation of HCV affects outcome of therapy is that patients infected with genotype 1 achieve SVR about 50% of the time following 48 weeks of therapy, whereas patients with genotypes 2 and 3 achieve SVR with frequencies >80% after only 24 weeks of treatment . HCV genotype is therefore a key parameter in deciding whether to initiate treatment, with a higher proportion of patients infected with genotype 2 and 3 being eligible for treatment. A fundamental aspect of the biology of HCV is its replication as a quasispecies. The influence of quasispecies diversity/complexity on efficiency of antiviral therapy has been extensively explored, with conflicting results. Better responses have been linked to low pretreatment quasispecies diversity/complexity in most studies [39–42] but not in others [43, 44]. The reasons for this discrepancy are not fully understood. In contrast, a rapid shift of the quasispecies spectrum early during treatment is clearly associated with better response [45, 46]. In an attempt to clarify the role of HCV quasispecies variation in viral sensitivity to IFN-based therapy, we evaluated the association of baseline HCV quasispecies diversity/complexity in the hypervariable region 1 of the E2 protein with response to therapy in 153 HCV genotype 1 patients and found that quasispecies diversity/complexity can affect the outcome of therapy, but that this effect may become apparent only when the diversity/complexity rises above a critical point . Variations in the quasispecies master sequence (defined in practical terms as the consensus HCV sequence within a patient) between individuals have also been associated with outcome of therapy. The first such observation was that the number of variations in subtype 1b amino acid residues 2209 to 2248 (the 'interferon sensitivity determining region', ISDR) relative to HCV strain J was correlated with response to IFN-based therapy . The ISDR is part of a PKR-binding site , and consequently this association is based on a reasonable mechanism: differential inhibition of PKR activity by variant HCV genomes. The association of variability in the ISDR with non-response has been consistently found in Japanese patients infected with subtype 1b, but is weak in other contexts [49, 50]. The sequence at the ISDR remains an independent predictor of outcome for Japanese genotype 1b patients even when normalized for the effect of IL28B polymorphisms [51, 52]. Variation at HCV core protein positions 70 and/or 91 relative to the prototype sequences of R70 and L90 has been repeatedly associated with non-response to IFN-based therapy in Japanese genotype 1b patients [53–55], but in not in genotype 2a patients . Variation at core residues 70 and/or 91 in HCV 1b patients has remained a predictor of treatment outcome in multivariate models including the IL28B polymorphisms  and during triple therapy including IFN, ribavirin and one of the promising NS3 protease inhibitors . Similarly, genetic variation at a PKR-binding site in the viral E2 protein, termed the PePHD, has been associated with response to therapy in a few studies [59, 60], but not in most [61, 62]. This association of low viral genetic diversity relative to the population-wide consensus sequence with poor response to therapy implies that viral sequences with low diversity are closest to an optimal sequence and hence have the greatest IFN-resistance potential. In this context, resistance can be impaired by variations at many different sites throughout the viral genome. However, results from the various HCV genetic studies have often been incompletely reproducible, possibly due to complementation between the multiple immunosuppressive activities of HCV that would not have been evident in analysis of individual viral genes. This appears to be the case because analysis of the full HCV coding potential revealed that the viral genomes in responders to IFN-based therapy are much more diverse than genomes from non-responders, that these diversity differences are concentrated in genes with known immunosuppressive activities (especially the core, E2, NS3 and NS5A genes), and that an individual isolate may not necessarily have the same diversity pattern at all of these genes [63–65]. Our very rough estimate is that differences in HCV genetic diversity among infected individuals may account for about 30% of the treatment failures ; this fraction is similar to that contributed by variation in the human IL28B locus . The potential for intragenomic complementation is emphasized by the recently discovered genome-wide hub-and-spoke networks of amino acid covariances in HCV [66, 67]. The structure of these networks indicates that the viral genome functions as an integrated unit. Therefore, we asked whether the networks could improve prediction of therapeutic efficacy through their ability to integrate information across the viral genome. The covariance networks were found to be very different in sequences from responders and non-responders to IFN-based therapy, and differences in the networks could help predict outcome of therapy in this set of samples . This result has not been independently confirmed because there are no other publicly available full-ORF HCV sequences from patients for whom the outcome of IFN-based therapy is known. Antiviral therapy for HCV will change dramatically in the near future as direct-acting antiviral drugs targeting the viral protease and RNA polymerase activities become available [9–11]. These compounds cannot be used as monotherapies because resistance develops within weeks when they are used alone [12, 68–70], so at least the first generation of direct-acting drugs will be used in combination with IFNα and ribavirin. Therefore, pharmacogenetic personalization of HCV therapy will soon add assessment of viral resistance mutations to the direct-acting agents to evaluation of host and viral markers of IFN efficacy. Evaluation of the resistance markers will be similar to what is currently done for HIV and hepatitis B virus [71, 72]. As the anti-HCV pharmacological toolbox increases, the viral markers governing efficacy of the direct-acting antivirals will become progressively more important for guiding the choice of drugs to be employed. Eventually, a cocktail of direct-acting compounds is expected to eliminate the need for IFN entirely. When this happens, the role of host immunological polymorphisms and immunosuppressive genetic patterns of HCV in predicting therapeutic efficacy will be supplanted by assessment of viral variables that define the sensitivity of a given HCV isolate to the drugs. A role for host markers in guiding therapy may persist, but it will be limited to evaluation of sensitivity to side-effects of the drugs. Although many promising anti-HCV drugs are in the pipeline, it is impossible to predict when IFN will be supplanted, and so pharmacogenetic prediction of the response of HCV to therapy will remain a dynamic field for the foreseeable future. HCV infections are a leading cause of liver disease and liver cancer worldwide. HCV infection is treated with IFNα plus ribavirin, but this expensive, year-long therapy is plagued with severe side-effects and it clears the virus in only about half of patients. Response of HCV to IFN-based therapy is affected by variations in human genes controlling antiviral immune responses and by differences in HCV genes that suppress these immune responses. The most prominent human genetic associations with outcome of therapy are polymorphisms within the IL28B gene, but associations with variations in the human leukocyte antigen and cytokine genes also exist. Obtaining a molecular understanding of the mechanisms by which these genetic associations modulate the outcome of therapy would substantially improve therapy. The most obvious viral genetic association is that HCV genotype 1 is less sensitive to treatment than are genotypes 2 and 3, but genetic differences at the isolate and quasispecies levels also affect outcome of therapy. Understanding the mechanisms underlying these viral genetic associations would also improve therapeutic options for HCV patients. The contribution of both host and viral genetic variations in determining the outcome of therapy indicates that predicting the outcome of therapy for HCV will require integrating the efficacies of the immunosuppressive mechanisms of a viral isolate, and then interpreting the viral resistance potential in context of the genetic profile of the patient at genes associated with outcome of therapy. Reaching this goal will require a deeper understanding than is currently available of the human and viral genetic associations with response to therapy and of how these genetic variations interact with each other. Anti-HCV therapy is expected to change dramatically in the near future with the approval of direct-acting inhibitors of viral proteins, so outcome prediction will soon need to incorporate viral genetic markers of the resistance of HCV to the new drugs. This will require detailed viral genetic analyses to identify clinically relevant resistance mutations and their cross-resistance characteristics. Eventually the direct-acting drugs are expected to eliminate the need for IFN and ribavirin. At this time, evaluation of human genetic markers of immunological efficacy and viral markers of immunosuppressive potential will be supplanted by assessment of viral biomarkers of drug sensitivity. JT is a Professor of Molecular Virology at Saint Louis University School of Medicine, and has expertise in hepatitis B virus replication and hepatitis C virus genetics. MD is a Research Associate Professor at Saint Louis University School of Medicine who specializes in bioinformatics. RA is an Associate Professor of Systems Biology at Saint Louis University School of Medicine, and has expertise in molecular biology and network analysis. XF is an Associate Professor of Molecular Virology at Saint Louis University who has expertise in HCV genetics. ADB is the Chair of Medicine at Saint Louis University, and has clinical and scientific expertise in viral hepatitis. Compilation of this review was supported by Saint Louis University institutional funds. JT, RA and MD are co-inventors on pending patent applications covering the use of covariance network analysis to predict the outcome of antiviral therapy. No other competing interests exist. JT coordinated the literature review and wrote the majority of the manuscript. MD and XF conducted primary literature searches and wrote the relevant sections of the text. RA and ADB contributed to the choice of topics covered in this article and evaluated its clinical and scientific accuracy. All authors read and approved the final manuscript.